This exquisite fireplace screen from Napa Forge not only protects your home and family from flying sparks and debris, it also provides the perfect embellishment for any fireplace. The elegant curves and natural accents of the black scroll work stand out beautifully against the light background of the screen. This piece is made of quality materials and comes with a 10-year limited warranty. 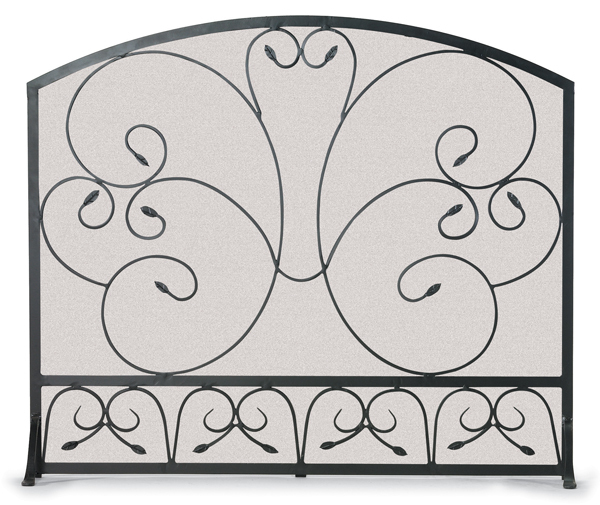 If you are looking for a fireplace accessory that will become the focal point of the room, this elegant fireplace screen from Napa Forge may be the piece that you fall in love with. What is the width of the feet of this screen from front to back? The manufacturer has just advised that the legs project 4 1/2 inches from the front of the screen and 3 1/4 inches from the back. Do the feet on the end just protrude out to the front or do they protrude to the front and back? This unit's stabilizing feet protrude both to the front and back. I can say with confidence that the cost of this screen does not match the quality. It is much better than advertised. Even though it is a great price, this screen is of very high quality. It grips the floor well, and looks great across our fireplace. If you are looking for a good inexpensive screen, I can guarantee that this screen can be the one you need.